SVOR Award 2013 for Best Master Thesis: Congratulations! 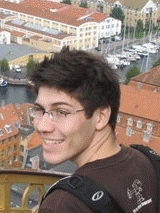 Tomas Robenek, now doctoral student in Civil and Environmental Engineering at EPFL, has won the SVOR (Swiss Association Operations Research) Award for his brilliant Master Thesis INTEGRATED BERTH ALLOCATION AND YARD ASSIGNMENT PROBLEM USING COLUMN GENERATION, Master Thesis, Danmarks Tekniske Universitet (DTU) and EPFL, Lausanne, 2012, which is also on the ZKS Foundation’s Publishing List. On May 3rd he will present his Master Thesis at the Swiss OR Days at the University of Geneva where he will also receive is Award. Posted on April 25, 2013 by ZKS Foundation, JR Partners and ÜserHuus	• This entry was posted in Uncategorized. Bookmark the permalink.